We are open Saturdays in December from 9.00am-5.00pm (except the 29th when we are closed). NB: the last delivery date for fresh flowers into the shop is Saturday 22nd December . Please order by Thursday 20th December if you want something particular. 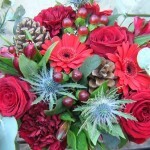 Our last date for deliveries of bouquets is Monday 24th December. Due to the volume of orders at this time of year, availbility of delivery slots will be limited on Monday and we recommend choosing Saturday or Sunday if you want flowers delivered close to Christmas. We are closed between 25th Dec and Tuesday 1st January.